f you're a military homeowner, once Uncle Sam says, “Jump!” you’ve got to pack up, move, and--somehow--leave behind the single largest financial investment you’ve ever made. Uncle Sam doesn’t care a whit if you loved that location, your upgraded kitchen, or your deep soaker tub. When it’s time to go, then go you must, and for military family homeowners, that means that you’ve got big financial decisions to make. Let's take a look at whether it makes sense for your family to sell your home. 1) What is the likelihood that you will return to this duty station? Even if you return to this duty station, will it be much later in your career when you’ve potentially got much different needs for your housing situation? For instance, more children, more pets, a greater need for entertaining larger groups are all reasons why your current home--no matter how cute--may not be a great fit for your family’s needs in the future. 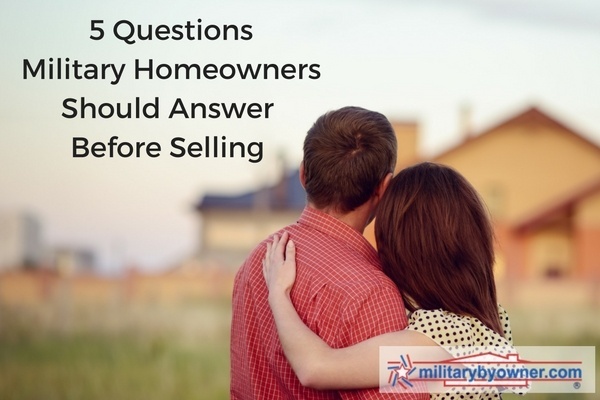 2) Do you intend to buy at your next duty station? Even if you used your VA entitlement on purchasing this home, you can still purchase another home at your next duty station without selling. However, you will likely need to show proof of income from a tenant lease on the property unless your spouse has sufficient income that will transition as a mobile career to offset the expense of that house on your next pre-approval. 3) Do you have the stomach for owning an investment property? If this is the home that you’re emotionally invested in because it’s the first home you lived in with your spouse and the first place you brought your baby home, then you might not want to see what 5-10 years as a renter-occupied unit might do to the space. Unfortunately, as military families, we don’t really have the luxury of keeping those sacred spaces that a civilian family might; we’ve got to move cherished memories in boxes with us. Even if you have the greatest, cleanest tenants in the world, that space that you and your spouse once occupied with your sweet newborn can never be recaptured. If you think you can’t stomach seeing the emotional transition of your home to your investment property, then it’s time to sell so you don’t have to bear witness. 4) Have you significantly upgraded the property? If you Gucci-ed up your property with top level granite, brushed stainless appliances, hand-scraped hardwood flooring, crown molding, and then some, then it’s likely time to sell. Even if you could rent out your property and cover your cost of homeownership, your upgrades won’t even recapture the same market value that they do right now. You’ll likely have to sink the cost of additional upgrades 10 years down the line once you do decide to sell. Unless you’re living in an exceptionally affluent area--and let’s face it, the areas right around most military installations don’t fit the bill--you’ll be hard-pressed to find the BAH bucks to cover the rent for your highly upgraded (and likely, beautiful) home. 5) Can you afford to sell? This is typically the sticking point for most military families. Even if you dearly want to sell, it’s not always financially feasible based on market conditions. Stay tuned for an upcoming post on how finances feature into the decision to rent or sell your home. If your answers to the above questions have left you needing more guidance as to what your next steps should be, then look no farther. 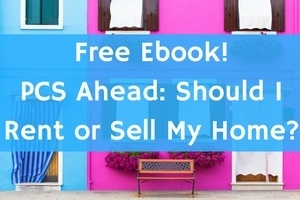 We're excited to announce our newest ebook, PCS Ahead: Should I Rent or Sell My Home?, which provides even more information on this common issue for military families.